wodTelnetDLX is a telnet client component ready to connect to various terminal based clients, most commonly to UNIX telnet daemon. Besides supported Telnet protocol, it also supports secured communication (through encryption) using well known SSH (SSH1 and SSH2 are supported), as well as SSL/TLS (Secure Socket Layer protocol). 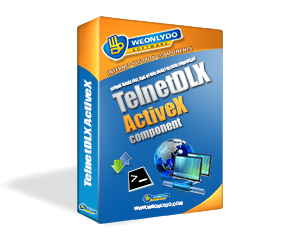 ActiveX version of the component has its own Terminal GUI (Graphic user interface) that supports VT100 and Linux emulation - so you can run your favorite UNIX tools with no need for 3rd party extensions - only with wodTelnetDLX. - Connects with ease even with secured WEB servers. - Allows transparent use of any of supported protocol. Change one property - leave other code the same!